STOCK# - PASR2336 MFG# - VLST-3W New and unused. This ships FREE within the U. 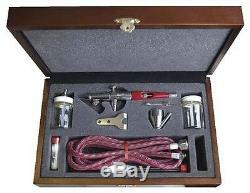 This is the VLSTPRO Airbrush Set with Wooden Box from Paasche. Double action internal mix airbrush Ideal for body art tattoo auto & motorcycle graphics T-shirt airbrushing and taxidermy-not recommended for painting models trains or R/C cars Rounded trigger button that rolls under your finger for greater comfort and better control. The new paint picker aircap lets you clean any accumulation of paint off the tip and needle with a quick pinch of the fingers. The trigger guide has been lengthened for increased paint flow at maximum draw and the cut-away handle allows quick pullback to blow out clogs. A threaded bottle connector fitting locks onto the bottle stem for worry-free one-handed painting; the bottle will not fall off once fastened properly. 5 to 1 cfm at 20-45lbs depending on type of fluid being sprayed. Packed in an attractive wooden box with Blue velvet interior New updated one piece metal head as of 2015. One Airbrush Head Protecting Cap Metal Color Cup Two 1oz Bottle Assemblies Medium Head Assembly (1/32 to 1 spray pattern) Heavy Head Assembly (1/16 to 1 spray pattern) Wrench Hanger 6 Braided Hose Instruction Manual 22 Airbrush Lessons Book. Air Source sdw 11/9/01 ir/kh updt jxs 01/13/11. Purchasers of this product also bought: Compatibility with the above product is not guaranteed. Click a description for product details. Moebius 1/128 Scale Mini Spindrift Rocket Transport. International Buyers Only - Please allow 2 to 4 weeks for international deliveries. The item "NEW Paasche VLSTPRO Wood Pro Airbrush Set VLST-3W NIB" is in sale since Thursday, February 19, 2015.